All types of cancer develop in our cells, the body's basic unit of life. To understand cancer, it is helpful to know how normal cells become cancerous. The body is made up of many types of cells. Normally, cells grow, divide, and produce more cells as needed to keep the body healthy and functioning properly. Sometimes, however, the process goes astray -- cells keep dividing when new cells are not needed. The mass of extra cells forms a growth or tumor. Tumors can be benign or malignant. The lungs, a pair of sponge-like, cone-shaped organs, are part of the respiratory system. The right lung has three sections, called lobes; it is a little larger than the left lung, which has two lobes. When we breathe in, the lungs take in oxygen, which our cells need to live and carry out their normal functions. When we breathe out, the lungs get rid of carbon dioxide, which is a waste product of the body's cells. 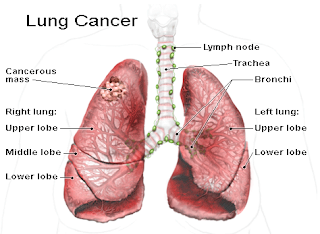 Cancer of the lung, like all cancers, results from an abnormality in the body's basic unit of life, the cell. Normally, the body maintains a system of checks and balances on cell growth so that cells divide to produce new cells only when new cells are needed. Disruption of this system of checks and balances on cell growth results in an uncontrolled division and proliferation of cells that eventually forms a mass known as a tumor. Tumors can be benign or malignant; when we speak of "cancer," we are referring to those tumors that are malignant. Benign tumors usually can be removed and do not spread to other parts of the body. Malignant tumors, on the other hand, grow aggressively and invade other tissues of the body, allowing entry of tumor cells into the bloodstream or lymphatic system and then to other sites in the body. This process of spread is termed metastasis; the areas of tumor growth at these distant sites are called metastases. Since lung cancer tends to spread or metastasize very early after it forms, it is a very life-threatening cancer and one of the most difficult cancers to treat. While lung cancer can spread to any organ in the body, certain locations -- particularly the adrenal glands, liver, brain, and bones -- are the most common sites for lung cancer metastasis. 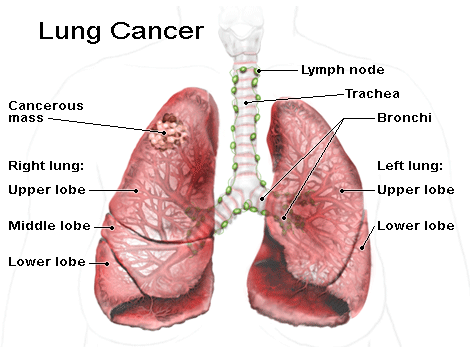 The lung also is a very common site for metastasis from tumors in other parts of the body. Tumor metastases are made up of the same type of cells as the original (primary) tumor. For example, if prostate cancer spreads via the bloodstream to the lungs, it is metastatic prostate cancer in the lung and is not lung cancer. The principal function of the lungs is to exchange gases between the air we breathe and the blood. Through the lung, carbon dioxide is removed from the bloodstream and oxygen from inspired air enters the bloodstream. The right lung has three lobes, while the left lung is divided into two lobes and a small structure called the lingula that is the equivalent of the middle lobe on the right. The major airways entering the lungs are the bronchi, which arise from the trachea. The bronchi branch into progressively smaller airways called bronchioles that end in tiny sacs known as alveoli where gas exchange occurs. The lungs and chest wall are covered with a thin layer of tissue called the pleura. 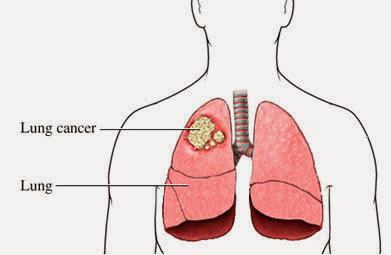 Lung cancers can arise in any part of the lung, but 90% to 95% of cancers of the lung are thought to arise from the epithelial cells, the cells lining the larger and smaller airways (bronchi and bronchioles); for this reason, lung cancers are sometimes called bronchogenic cancers or bronchogenic carcinomas. (Carcinoma is another term for cancer.) Cancers also can arise from the pleura (called mesotheliomas) or rarely from supporting tissues within the lungs, for example, the blood vessels. Lung cancer is the most common cause of death due to cancer in both men and women throughout the world. Statistics from the American Cancer Society estimated that about 228,000 new cases of lung cancer in the U.S. will be diagnosed and about 159,000 deaths due to lung cancer would occur in 2013. According to the U.S. National Cancer Institute, approximately one out of every 14 men and women in the U.S. will be diagnosed with cancer of the lung at some point in their lifetime. Lung cancer is predominantly a disease of the elderly; almost 70% of people diagnosed with lung cancer are over 65 years of age, while less than 3% of lung cancers occur in people under 45 years of age. Lung cancer was not common prior to the 1930s but increased dramatically over the following decades as tobacco smoking increased. In many developing countries, the incidence of lung cancer is beginning to fall following public education about the dangers of cigarette smoking and the introduction of effective smoking-cessation programs. Nevertheless, lung cancer remains among the most common types of cancers in both men and women worldwide. In the U.S., lung cancer has surpassed breast cancer as the most common cause of cancer-related deaths in women. The incidence of lung cancer is strongly correlated with cigarette smoking, with about 90% of lung cancers arising as a result of tobacco use. The risk of lung cancer increases with the number of cigarettes smoked and the time over which smoking has occurred; doctors refer to this risk in terms of pack-years of smoking history (the number of packs of cigarettes smoked per day multiplied by the number of years smoked). For example, a person who has smoked two packs of cigarettes per day for 10 years has a 20 pack-year smoking history. While the risk of lung cancer is increased with even a 10-pack-year smoking history, those with 30-pack-year histories or more are considered to have the greatest risk for the development of lung cancer. Among those who smoke two or more packs of cigarettes per day, one in seven will die of lung cancer. Pipe and cigar smoking also can cause lung cancer, although the risk is not as high as with cigarette smoking. Thus, while someone who smokes one pack of cigarettes per day has a risk for the development of lung cancer that is 25 times higher than a nonsmoker, pipe and cigar smokers have a risk of lung cancer that is about five times that of a nonsmoker. Tobacco smoke contains over 4,000 chemical compounds, many of which have been shown to be cancer-causing or carcinogenic. The two primary carcinogens in tobacco smoke are chemicals known as nitrosamines and polycyclic aromatic hydrocarbons. The risk of developing lung cancer decreases each year following smoking cessation as normal cells grow and replace damaged cells in the lung. In former smokers, the risk of developing lung cancer begins to approach that of a nonsmoker about 15 years after cessation of smoking. Passive smoking or the inhalation of tobacco smoke by nonsmokers who share living or working quarters with smokers, also is an established risk factor for the development of lung cancer. Research has shown that nonsmokers who reside with a smoker have a 24% increase in risk for developing lung cancer when compared with nonsmokers who do not reside with a smoker. The risk appears to increase with the degree of exposure (number of years exposed and number of cigarettes smoked by the household partner). An estimated 3,000 lung cancer deaths that occur each year in the U.S. are attributable to passive smoking. Asbestos fibers are silicate fibers that can persist for a lifetime in lung tissue following exposure to asbestos. The workplace was a common source of exposure to asbestos fibers, as asbestos was widely used in the past as both thermal and acoustic insulation. Today, asbestos use is limited or banned in many countries, including the U.S. Both lung cancer and mesothelioma (cancer of the pleura of the lung as well as of the lining of the abdominal cavity called the peritoneum) are associated with exposure to asbestos. Cigarette smoking drastically increases the chance of developing an asbestos-related lung cancer in workers exposed to asbestos. Asbestos workers who do not smoke have a fivefold greater risk of developing lung cancer than nonsmokers, but asbestos workers who smoke have a risk that is fifty- to ninety-fold greater than nonsmokers. Radon gas is a natural radioactive gas that is a natural decay product of uranium. Uranium decays to form products, including radon, that emit a type of ionizing radiation. Radon gas is a known cause of lung cancer, with an estimated 12% of lung-cancer deaths attributable to radon gas, or about 20,000 lung-cancer-related deaths annually in the U.S., making radon the second leading cause of lung cancer in the U.S. As with asbestos exposure, concomitant smoking greatly increases the risk of lung cancer with radon exposure. Radon gas can travel up through soil and enter homes through gaps in the foundation, pipes, drains, or other openings. The U.S. Environmental Protection Agency estimates that one out of every 15 homes in the U.S. contains dangerous levels of radon gas. Radon gas is invisible and odorless, but it can be detected with simple test kits. While the majority of lung cancers are associated with tobacco smoking, the fact that not all smokers eventually develop lung cancer suggests that other factors, such as individual genetic susceptibility, may play a role in the causation of lung cancer. Numerous studies have shown that lung cancer is more likely to occur in both smoking and nonsmoking relatives of those who have had lung cancer than in the general population. One study in never-smokers showed that a genetic change at a single region on chromosome 13 was associated with an increase in risk for developing non-small cell lung cancer. A large genetic study of lung cancer that involved over 10,000 people from 18 countries and led by the International Agency for Research on Cancer (IARC), identified a small region in the genome (DNA) that contains genes that appear to confer an increased susceptibility to lung cancer in smokers. The specific genes, located on the q arm of chromosome 15, code for proteins that interact with nicotine and other tobacco toxins (nicotinic acetylcholine receptor genes). 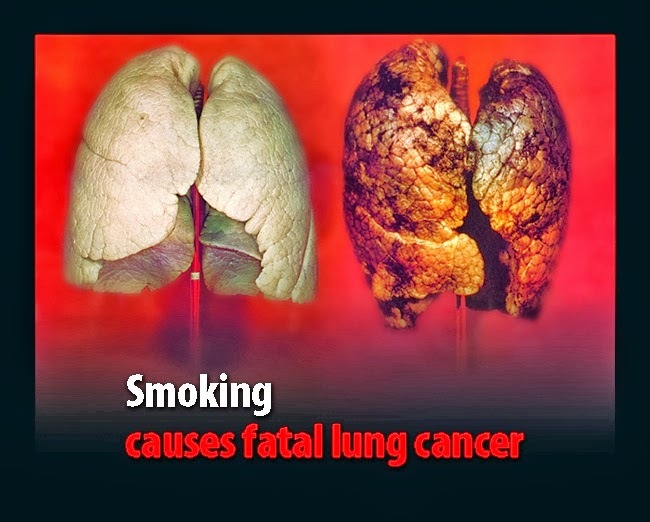 The presence of certain diseases of the lung, notably chronic obstructive pulmonary disease (COPD), is associated with an increased risk (four- to six-fold the risk of a nonsmoker) for the development of lung cancer even after the effects of concomitant cigarette smoking are excluded. Pulmonary fibrosis (scarring of the lung) appears to increase the risk about seven-fold, and this risk does not appear to be related to smoking. Survivors of lung cancer have a greater risk of developing a second lung cancer than the general population has of developing a first lung cancer. Survivors of non-small cell lung cancers (NSCLCs, see below) have an additive risk of 1% to 2% per year for developing a second lung cancer. In survivors of small cell lung cancers (SCLCs, see below), the risk for development of second lung cancers approaches 6% per year. Researchers continue to study the causes of lung cancer and to search for ways to prevent it. We already know that the best way to prevent lung cancer is to quit (or never start) smoking. The sooner a person quits smoking the better. Even if you have been smoking for many years, it's never too late to benefit from quitting. Lung cancers, also known as bronchogenic carcinomas, are broadly classified into two types: small cell lung cancers (SCLC) and non-small cell lung cancers (NSCLC). This classification is based upon the microscopic appearance of the tumor cells themselves. These two types of cancers grow and spread in different ways and may have different treatment options, so a distinction between these two types is important. Adenocarcinomas are the most commonly seen type of NSCLC in the U.S. and comprise up to 50% of NSCLC. While adenocarcinomas are associated with smoking, like other lung cancers, this type is observed as well in nonsmokers who develop lung cancer. Most adenocarcinomas arise in the outer, or peripheral, areas of the lungs. Bronchioloalveolar carcinoma is a subtype of adenocarcinoma that frequently develops at multiple sites in the lungs and spreads along the preexisting alveolar walls. Bronchial carcinoids account for up to 5% of lung cancers. These tumors are generally small (3 cm to 4 cm or less) when diagnosed and occur most commonly in people under 40 years of age. Unrelated to cigarette smoking, carcinoid tumors can metastasize, and a small proportion of these tumors secrete hormone-like substances that may cause specific symptoms related to the hormone being produced. Carcinoids generally grow and spread more slowly than bronchogenic cancers, and many are detected early enough to be amenable to surgical resection. What are lung cancer symptoms and signs? In up to 25% of people who get lung cancer, the cancer is first discovered on a routine chest X-ray or CT scan as a solitary small mass sometimes called a coin lesion, since on a two-dimensional X-ray or CT scan, the round tumor looks like a coin. These patients with small, single masses often report no symptoms at the time the cancer is discovered. The growth of the cancer and invasion of lung tissues and surrounding tissue may interfere with breathing, leading to symptoms such as cough, shortness of breath, wheezing, chest pain, and coughing up blood (hemoptysis). If the cancer has invaded nerves, for example, it may cause shoulder pain that travels down the outside of the arm (called Pancoast syndrome) or paralysis of the vocal cords leading to hoarseness. Invasion of the esophagus may lead to difficulty swallowing (dysphagia). If a large airway is obstructed, collapse of a portion of the lung may occur and cause infections (abscesses, pneumonia) in the obstructed area. Lung cancer that has spread to the bones may produce excruciating pain at the sites of bone involvement. Cancer that has spread to the brain may cause a number of neurologic symptoms that may include blurred vision, headaches, seizures, or symptoms of stroke such as weakness or loss of sensation in parts of the body. Lung cancers frequently are accompanied by symptoms that result from production of hormone-like substances by the tumor cells. These paraneoplastic syndromes occur most commonly with SCLC but may be seen with any tumor type. A common paraneoplastic syndrome associated with SCLC is the production of a hormone called adrenocorticotrophic hormone (ACTH) by the cancer cells, leading to oversecretion of the hormone cortisol by the adrenal glands (Cushing's syndrome). The most frequent paraneoplastic syndrome seen with NSCLC is the production of a substance similar to parathyroid hormone, resulting in elevated levels of calcium in the bloodstream. Nonspecific symptoms seen with many cancers, including lung cancers, include weight loss, weakness, and fatigue. Psychological symptoms such as depression and mood changes are also common. The history and physical examination may reveal the presence of symptoms or signs that are suspicious for lung cancer. In addition to asking about symptoms and risk factors for cancer development such as smoking, doctors may detect signs of breathing difficulties, airway obstruction, or infections in the lungs. Cyanosis, a bluish color of the skin and the mucous membranes due to insufficient oxygen in the blood, suggests compromised function due to chronic disease of the lung. Likewise, changes in the tissue of the nail beds, known as clubbing, also may indicate chronic lung disease. The chest X-ray is the most common first diagnostic step when any new symptoms of lung cancer are present. The chest X-ray procedure often involves a view from the back to the front of the chest as well as a view from the side. Like any X-ray procedure, chest X-rays expose the patient briefly to a small amount of radiation. Chest X-rays may reveal suspicious areas in the lungs but are unable to determine if these areas are cancerous. In particular, calcified nodules in the lungs or benign tumors called hamartomas may be identified on a chest X-ray and mimic lung cancer. CT (computerized tomography, computerized axial tomography, or CAT) scans may be performed on the chest, abdomen, and/or brain to examine for both metastatic and lung tumors. A CT scan of the chest may be ordered when X-rays do not show an abnormality or do not yield sufficient information about the extent or location of a tumor. CT scans are X-ray procedures that combine multiple images with the aid of a computer to generate cross-sectional views of the body. The images are taken by a large donut-shaped X-ray machine at different angles around the body. One advantage of CT scans is that they are more sensitive than standard chest X-rays in the detection of lung nodules, that is, they will demonstrate more nodules. Sometimes intravenous contrast material is given prior to the scan to help delineate the organs and their positions. A CT scan exposes the patient to a minimal amount of radiation. The most common side effect is an adverse reaction to intravenous contrast material that may have been given prior to the procedure. This may result in itching, a rash, or hives that generally disappear rather quickly. Severe anaphylactic reactions (life-threatening allergic reactions with breathing difficulties) to contrast material are rare. CT scans of the abdomen may identify metastatic cancer in the liver or adrenal glands, and CT scans of the head may be ordered to reveal the presence and extent of metastatic cancer in the brain. A technique called a low-dose helical CT scan (or spiral CT scan) is sometimes used in screening for lung cancers. This procedure requires a special type of CT scanner and has been shown to be an effective tool for the identification of small lung cancers in smokers and former smokers. However, it has not yet been proven whether the use of this technique actually saves lives or lowers the risk of death from lung cancer. The heightened sensitivity of this method is actually one of the sources of its drawbacks, since lung nodules requiring further evaluation will be seen in approximately 20% of people with this technique. Of the nodules identified by low-dose helical screening CTs, 90% are not cancerous but require up to 2 years of costly and often uncomfortable follow-up and testing. Trials are underway to further determine the utility of spiral CT scans in screening for lung cancer. Magnetic resonance imaging (MRI) scans may be appropriate when precise detail about a tumor's location is required. The MRI technique uses magnetism, radio waves, and a computer to produce images of body structures. As with CT scanning, the patient is placed on a moveable bed which is inserted into the MRI scanner. There are no known side effects of MRI scanning, and there is no exposure to radiation. The image and resolution produced by MRI is quite detailed and can detect tiny changes of structures within the body. People with heart pacemakers, metal implants, artificial heart valves, and other surgically implanted structures cannot be scanned with an MRI because of the risk that the magnet may move the metal parts of these structures. Positron emission tomography (PET) scanning is a specialized imaging technique that uses short-lived radioactive drugs to produce three-dimensional colored images of those substances in the tissues within the body. While CT scans and MRI scans look at anatomical structures, PET scans measure metabolic activity and the function of tissues. PET scans can determine whether a tumor tissue is actively growing and can aid in determining the type of cells within a particular tumor. In PET scanning, the patient receives a short half-lived radioactive drug, receiving approximately the amount of radiation exposure as two chest X-rays. The drug accumulates in certain tissues more than others, depending on the drug that is injected. The drug discharges particles known as positrons from whatever tissues take them up. As the positrons encounter electrons within the body, a reaction producing gamma rays occurs. A scanner records these gamma rays and maps the area where the radioactive drug has accumulated. For example, combining glucose (a common energy source in the body) with a radioactive substance will show where glucose is rapidly being used, for example, in a growing tumor. PET scanning may also be integrated with CT scanning in a technique known as PET-CT scanning. Integrated PET-CT has been shown to improve the accuracy of staging (see below) over PET scanning alone. Bone scans are used to create images of bones on a computer screen or on film. Doctors may order a bone scan to determine whether a lung cancer has metastasized to the bones. In a bone scan, a small amount of radioactive material is injected into the bloodstream and collects in the bones, especially in abnormal areas such as those involved by metastatic tumors. The radioactive material is detected by a scanner, and the image of the bones is recorded on a special film for permanent viewing. Sputum cytology: The diagnosis of lung cancer always requires confirmation of malignant cells by a pathologist, even when symptoms and X-ray studies are suspicious for lung cancer. The simplest method to establish the diagnosis is the examination of sputum under a microscope. If a tumor is centrally located and has invaded the airways, this procedure, known as a sputum cytology examination, may allow visualization of tumor cells for diagnosis. This is the most risk-free and inexpensive tissue diagnostic procedure, but its value is limited since tumor cells will not always be present in sputum even if a cancer is present. Also, noncancerous cells may occasionally undergo changes in reaction to inflammation or injury that makes them look like cancer cells. Examination of the airways by bronchoscopy (visualizing the airways through a thin, fiberoptic probe inserted through the nose or mouth) may reveal areas of tumor that can be sampled (biopsied) for diagnosis by a pathologist. A tumor in the central areas of the lung or arising from the larger airways is accessible to sampling using this technique. Bronchoscopy may be performed using a rigid or a flexible fiberoptic bronchoscope and can be performed in a same-day outpatient bronchoscopy suite, an operating room, or on a hospital ward. The procedure can be uncomfortable, and it requires sedation or anesthesia. While bronchoscopy is relatively safe, it must be carried out by a lung specialist (pulmonologist or surgeon) experienced in the procedure. When a tumor is visualized and adequately sampled, an accurate cancer diagnosis usually is possible. Some patients may cough up dark-brown blood for 1 to 2 days after the procedure. More serious but rare complications include a greater amount of bleeding, decreased levels of oxygen in the blood, and heart arrhythmias as well as complications from sedative medications and anesthesia. Fine needle aspiration (FNA) through the skin, most commonly performed with radiological imaging for guidance, may be useful in retrieving cells for diagnosis from tumor nodules in the lungs. Needle biopsies are particularly useful when the lung tumor is peripherally located in the lung and not accessible to sampling by bronchoscopy. A small amount of local anesthetic is given prior to insertion of a thin needle through the chest wall into the abnormal area in the lung. Cells are suctioned into the syringe and are examined under the microscope for tumor cells. This procedure is generally accurate when the tissue from the affected area is adequately sampled, but in some cases, adjacent or uninvolved areas of the lung may be mistakenly sampled. A small risk (3% to 5%) of an air leak from the lungs (called a pneumothorax, which can easily be treated) accompanies the procedure. Sometimes lung cancers involve the lining tissue of the lungs (pleura) and lead to an accumulation of fluid in the space between the lungs and chest wall (called a pleural effusion). Aspiration of a sample of this fluid with a thin needle (thoracentesis) may reveal the cancer cells and establish the diagnosis. As with the needle biopsy, a small risk of a pneumothorax is associated with this procedure. If none of the aforementioned methods yields a diagnosis, surgical methods must be employed to obtain tumor tissue for diagnosis. These can include mediastinoscopy (examining the chest cavity between the lungs through a surgically inserted probe with biopsy of tumor masses or lymph nodes that may contain metastases) or thoracotomy (surgical opening of the chest wall for removal or biopsy of a tumor). With a thoracotomy, it is rare to be able to completely remove a lung cancer, and both mediastinoscopy and thoracotomy carry the risks of major surgical procedures (complications such as bleeding, infection, and risks from anesthesia and medications). These procedures are performed in an operating room, and the patient must be hospitalized. While routine blood tests alone cannot diagnose lung cancer, they may reveal biochemical or metabolic abnormalities in the body that accompany cancer. For example, elevated levels of calcium or of the enzyme alkaline phosphatase may accompany cancer that is metastatic to the bones. Likewise, elevated levels of certain enzymes normally present within liver cells, including aspartate aminotransferase (AST or SGOT) and alanine aminotransferase (ALT or SGPT), signal liver damage, possibly through the presence of tumor metastatic to the liver. One current focus of research in the area of lung cancer is the development of a blood test to aid in the diagnosis of lung cancer. Researchers have preliminary data that has identified specific proteins, or biomarkers, that are in the blood and may signal that lung cancer is present in someone with a suspicious area seen on a chest X-ray or other imaging study. As with other cancers, therapy may be prescribed that is intended to be curative (removal or eradication of a cancer) or palliative (measures that are unable to cure a cancer but can reduce pain and suffering). More than one type of therapy may be prescribed. In such cases, the therapy that is added to enhance the effects of the primary therapy is referred to as adjuvant therapy. An example of adjuvant therapy is chemotherapy or radiotherapy administered after surgical removal of a tumor in an attempt to kill any tumor cells that remain following surgery. Surgical removal of the tumor is generally performed for limited-stage (stage I or sometimes stage II) NSCLC and is the treatment of choice for cancer that has not spread beyond the lung. About 10% to 35% of lung cancers can be removed surgically, but removal does not always result in a cure, since the tumors may already have spread and can recur at a later time. Among people who have an isolated, slow-growing lung cancer removed, 25% to 40% are still alive 5 years after diagnosis. It is important to note that although a tumor may be anatomically suitable for resection, surgery may not be possible if the person has other serious conditions (such as severe heart or lung disease) that would limit their ability to survive an operation. Surgery is less often performed with SCLC than with NSCLC because these tumors are less likely to be localized to one area that can be removed. The surgical procedure chosen depends upon the size and location of the tumor. Surgeons must open the chest wall and may perform a wedge resection of the lung (removal of a portion of one lobe), a lobectomy (removal of one lobe), or a pneumonectomy (removal of an entire lung). Sometimes lymph nodes in the region of the lungs also are removed (lymphadenectomy). Surgery for lung cancer is a major surgical procedure that requires general anesthesia, hospitalization, and follow-up care for weeks to months. Following the surgical procedure, patients may experience difficulty breathing, shortness of breath, pain, and weakness. The risks of surgery include complications due to bleeding, infection, and complications of general anesthesia. Radiation therapy may be employed as a treatment for both NSCLC and SCLC. Radiation therapy uses high-energy X-rays or other types of radiation to kill dividing cancer cells. Radiation therapy may be given as curative therapy, palliative therapy (using lower doses of radiation than with curative therapy), or as adjuvant therapy in combination with surgery or chemotherapy. The radiation is either delivered externally, by using a machine that directs radiation toward the cancer, or internally through placement of radioactive substances in sealed containers within the area of the body where the tumor is localized. Brachytherapy is a term used to describe the use of a small pellet of radioactive material placed directly into the cancer or into the airway next to the cancer. This is usually done through a bronchoscope. Radiation therapy can be given if a person refuses surgery, if a tumor has spread to areas such as the lymph nodes or trachea making surgical removal impossible, or if a person has other conditions that make them too ill to undergo major surgery. Radiation therapy generally only shrinks a tumor or limits its growth when given as a sole therapy, yet in 10% to 15% of people it leads to long-term remission and palliation of the cancer. Combining radiation therapy with chemotherapy can further prolong survival when chemotherapy is administered. External radiation therapy can generally be carried out on an outpatient basis, while internal radiation therapy requires a brief hospitalization. A person who has severe lung disease in addition to a lung cancer may not be able to receive radiotherapy to the lung since the radiation can further decrease function of the lungs. A type of external radiation therapy called the "gamma knife" is sometimes used to treat single brain metastases. In this procedure, multiple beams of radiation coming from different directions are focused on the tumor over a few minutes to hours while the head is held in place by a rigid frame. This reduces the dose of radiation that is received by noncancerous tissues. For external radiation therapy, a process called simulation is necessary prior to treatment. Using CT scans, computers, and precise measurements, simulation maps out the exact location where the radiation will be delivered, called the treatment field or port. This process usually takes 30 minutes to 2 hours. The external radiation treatment itself generally is done 4 or 5 days a week for several weeks. Radiation therapy does not carry the risks of major surgery, but it can have unpleasant side effects, including fatigue and lack of energy. A reduced white blood cell count (rendering a person more susceptible to infection) and low blood platelet levels (making blood clotting more difficult and resulting in excessive bleeding) also can occur with radiation therapy. If the digestive organs are in the field exposed to radiation, patients may experience nausea, vomiting, or diarrhea. Radiation therapy can irritate the skin in the area that is treated, but this irritation generally improves with time after treatment has ended. Both NSCLC and SCLC may be treated with chemotherapy. Chemotherapy refers to the administration of drugs that stop the growth of cancer cells by killing them or preventing them from dividing. Chemotherapy may be given alone, as an adjuvant to surgical therapy, or in combination with radiotherapy. While a number of chemotherapeutic drugs have been developed, the class of drugs known as the platinum-based drugs have been the most effective in treatment of lung cancers. Chemotherapy is the treatment of choice for most SCLC, since these tumors are generally widespread in the body when they are diagnosed. Only half of people who have SCLC survive for 4 months without chemotherapy. With chemotherapy, their survival time is increased up to four- to fivefold. Chemotherapy alone is not particularly effective in treating NSCLC, but when NSCLC has metastasized, it can prolong survival in many cases. Chemotherapy may be given as pills, as an intravenous infusion, or as a combination of the two. Chemotherapy treatments usually are given in an outpatient setting. A combination of drugs is given in a series of treatments, called cycles, over a period of weeks to months, with breaks in between cycles. Unfortunately, the drugs used in chemotherapy also kill normally dividing cells in the body, resulting in unpleasant side effects. Damage to blood cells can result in increased susceptibility to infections and difficulties with blood clotting (bleeding or bruising easily). Other side effects include fatigue, weight loss, hair loss, nausea, vomiting, diarrhea, and mouth sores. The side effects of chemotherapy vary according to the dosage and combination of drugs used and may also vary from individual to individual. Medications have been developed that can treat or prevent many of the side effects of chemotherapy. The side effects generally disappear during the recovery phase of the treatment or after its completion. SCLC often spreads to the brain. Sometimes people with SCLC that is responding well to treatment are treated with radiation therapy to the head to treat very early spread to the brain (called micrometastasis) that is not yet detectable with CT or MRI scans and has not yet produced symptoms. Brain radiation therapy can cause short-term memory problems, fatigue, nausea, and other side effects. Lung cancer that has returned following treatment with surgery, chemotherapy, and/or radiation therapy is referred to as recurrent or relapsed. If a recurrent cancer is confined to one site in the lung, it may be treated with surgery. Recurrent tumors generally do not respond to the chemotherapeutic drugs that were previously administered. Since platinum-based drugs are generally used in initial chemotherapy of lung cancers, these agents are not useful in most cases of recurrence. A type of chemotherapy referred to as second-line chemotherapy is used to treat recurrent cancers that have previously been treated with chemotherapy, and a number of second-line chemotherapeutic regimens have been proven effective at prolonging survival. People with recurrent lung cancer who are well enough to tolerate therapy also are good candidates for experimental therapies (see below), including clinical trials. The drugs erlotinib (Tarceva) and gefitinib (Iressa) are so-called targeted drugs, which may be used in certain patients with NSCLC who are no longer responding to chemotherapy. Targeted therapy drugs more specifically target cancer cells, resulting in less damage to normal cells than general chemotherapeutic agents. Erlotinib and gefitinib target a protein called the epidermal growth factor receptor (EGFR) that is important in promoting the division of cells. This protein is found at abnormally high levels on the surface of some types of cancer cells, including many cases of non-small cell lung cancer. Other attempts at targeted therapy include drugs known as antiangiogenesis drugs, which block the development of new blood vessels within a cancer. Without adequate blood vessels to supply oxygen-carrying blood, the cancer cells will die. The antiangiogenic drug bevacizumab (Avastin) has also been found to prolong survival in advanced lung cancer when it is added to the standard chemotherapy regimen. Bevacizumab is given intravenously every 2 to 3 weeks. However, since this drug may cause bleeding, it is not appropriate for use in patients who are coughing up blood, if the lung cancer has spread to the brain, or in people who are receiving anticoagulation therapy ("blood thinner" medications). Bevacizumab also is not used in cases of squamous cell cancer because it leads to bleeding from this type of lung cancer. Cetuximab is an antibody that binds to the epidermal growth factor receptor (EGFR). In patients with NSCLC whose tumors have been shown to express the EGFR by immunohistochemical analysis, the addition of cetuximab may be considered for some patients. One newer therapy used for different types and stages of lung cancer (as well as some other cancers) is photodynamic therapy. In photodynamic treatment, a photosynthesizing agent (such as a porphyrin, a naturally occurring substance in the body) is injected into the bloodstream a few hours prior to surgery. During this time, the agent is taken up in rapidly growing cells such as cancer cells. A procedure then follows in which the physician applies a certain wavelength of light through a handheld wand directly to the site of the cancer and surrounding tissues. The energy from the light activates the photosensitizing agent, causing the production of a toxin that destroys the tumor cells. PDT has the advantages that it can precisely target the location of the cancer, is less invasive than surgery, and can be repeated at the same site if necessary. The drawbacks of PDT are that it is only useful in treating cancers that can be reached with a light source and is not suitable for treatment of extensive cancers. The U.S. Food and Drug Administration (FDA) has approved the photosensitizing agent called porfimer sodium (Photofrin) for use in PDT to treat or relieve the symptoms of esophageal cancer and non-small cell lung cancer. Further research is ongoing to determine the effectiveness of PDT in other types of lung cancer. Radiofrequency ablation is being studied as an alternative to surgery, particularly in cases of early stage lung cancer. In this type of treatment, a needle is inserted through the skin into the cancer, usually under guidance by CT scanning. Radiofrequency (electrical) energy is then transmitted to the tip of the needle where it produces heat in the tissues, killing the cancerous tissue and closing small blood vessels that supply the cancer. RFA usually is not painful and has been approved by the U.S. Food and Drug Administration for the treatment of certain cancers, including lung cancers. Studies have shown that this treatment can prolong survival similarly to surgery when used to treat early stages of lung cancer but without the risks of major surgery and the prolonged recovery time associated with major surgical procedures. Since no therapy is currently available that is absolutely effective in treating lung cancer, patients may be offered a number of new therapies that are still in the experimental stage, meaning that doctors do not yet have enough information to decide whether these therapies should become accepted forms of treatment for lung cancer. New drugs or new combinations of drugs are tested in so-called clinical trials, which are studies that evaluate the effectiveness of new medications in comparison with those treatments already in widespread use. Experimental treatments known as immunotherapies are being studied that involve the use of vaccine-related therapies or other therapies that attempt to utilize the body's immune system to fight cancer cells. Vaccine therapies against lung cancer are another area in which research is ongoing. In 2010, a treatment vaccine for advanced prostate cancer gained approval by the FDA, and lung cancer treatment vaccines are also being studied in clinical trials. Patients with non-small cell lung cancer may be treated in several ways. The choice of lung cancer treatment depends mainly on the size, location, and extent of the tumor. Surgery is the most common way to treat this type of lung cancer. Cryosurgery, a treatment that freezes and destroys cancer tissue, may be used to control symptoms in the later stages of non-small cell lung cancer. Radiation therapy and chemotherapy may also be used to slow the progress of the disease and to manage symptoms. Small cell lung cancer spreads quickly. In many cases, cancer cells have already spread to other parts of the body when the disease is diagnosed. In order to reach cancer cells throughout the body, doctors almost always use chemotherapy. Treatment may also include radiation therapy aimed at the tumor in the lung or tumors in other parts of the body (such as in the brain). Some patients have radiation therapy to the brain even though no cancer is found there. This treatment, called prophylactic cranial irradiation (PCI), is given to prevent tumors from forming in the brain. Surgery is part of the treatment plan for a small number of patients with small cell lung cancer. The side effects of cancer treatment depend on the type of treatment and may be different for each person. Side effects are often only temporary. Doctors and nurses can explain the possible side effects of treatment, and they can suggest ways to help relieve symptoms that may occur during and after lung cancer treatment. Chemotherapy affects normal as well as cancerous cells. Side effects depend largely on the specific drugs and the dose (amount of drug given). Common side effects of chemotherapy include nausea and vomiting, hair loss, mouth sores, and fatigue. Radiation therapy, like chemotherapy, affects normal as well as cancerous cells. Side effects of radiation therapy depend mainly on the part of the body that is treated and the treatment dose. Common side effects of radiation therapy are a dry, sore throat; difficulty swallowing; fatigue; skin changes at the site of treatment; and loss of appetite. Patients receiving radiation to the brain may have headaches, skin changes, fatigue, nausea and vomiting, hair loss, or problems with memory and thought processes. Photodynamic therapy makes the skin and eyes sensitive to light for 6 weeks or more after treatment. Patients are advised to avoid direct sunlight and bright indoor light for at least 6 weeks. If patients must go outdoors, they need to wear protective clothing, including sunglasses. Other temporary side effects of PDT may include coughing, trouble swallowing, and painful breathing or shortness of breath. Patients should talk with their doctor about what to do if the skin becomes blistered, red, or swollen. Today, because of what has been learned in clinical trials, doctors are able to control, lessen, or avoid many of the side effects of treatment. Experts have identified several causes of lung cancer. Most lung cancers are caused by the use of tobacco. Changing your lifestyle can, over time, gradually reduce some of your risk for lung cancer. To prevent lung and other cancers, do not use tobacco. If you do use tobacco, you can reduce your risk of lung cancer by quitting. Your risk will gradually decrease with time as your lungs recover. Quitting smoking reduces your risk for cancer, and your risk continues to decrease as long as you do not smoke. The benefit of quitting smoking is greater the younger you quit. Recent studies on the connection between diet and lung cancer have shown mixed results. Antioxidants, phytoestrogens (found in a wide variety of whole grains, legumes, vegetables, and soy products), and cruciferous vegetables (like broccoli) may reduce the risk of lung cancer. But there is not clear evidence that these foods help protect high risk people. Other research shows that taking supplements of beta-carotene, vitamin E, and retinoids may actually be harmful and increase the risk of lung cancer in people who continue to smoke. Nicotine gum, medicated nicotine inhalers, nicotine patches, and oral medicines such as varenicline (Chantix)) or bupropion are available to help you to quit smoking. During treatment for any stage of lung cancer, you can manage some side effects that may accompany lung cancer or cancer treatment. If your doctor has given you instructions or medicines to treat these symptoms, be sure to follow them. In general, healthy habits such as eating a balanced diet, getting enough sleep, and exercising regularly may help control your symptoms. Home treatment may help relieve some common side effects of cancer treatment. Home treatment for nausea or vomiting includes watching for and treating early signs of dehydration, such as a dry mouth, sticky saliva, and reduced urine output with dark yellow urine. Your doctor also may prescribe medicines to control nausea and vomiting. Home treatment for fatigue includes making sure you get extra rest while you are receiving chemotherapy or radiation therapy. Let your symptoms be your guide. You may be able to keep your usual routine and just get some extra sleep. Fatigue is often worse at the end of treatment or just after treatment is completed. Hair loss. You may be concerned about losing your hair from cancer treatment. Not all chemotherapy medicines cause hair loss, and some people have only mild thinning that is noticeable only to them. Talk to your doctor about whether hair loss is an expected side effect of the medicines you will receive. Sleep problems. If you find you have trouble sleeping, having a regular bedtime, doing some exercise during the day, avoiding caffeine late in the day, and taking other steps to relieve sleep problems may help you sleep more easily. Rinse your mouth several times a day with a warm saltwater solution. You can make the saltwater mixture with 1 tsp (5 g) of salt in 8 fl oz (0.2 L) of warm water. Do not eat or drink acidic foods, such as tomatoes or oranges. See other home treatments for a sore mouth. Followup care after lung cancer treatment is very important. Regular checkups ensure that changes in health are noticed, and if the cancer returns or a new cancer develops, it can be treated as soon as possible. Checkups may include physical exams, chest x-rays, or lab tests. Between scheduled appointments, people who have had lung cancer should report any health problems to their doctor as soon as they appear. Living with a serious disease, such as cancer, is challenging. Apart from having to cope with the physical and medical challenges, people with cancer face many worries, feelings, and concerns that can make life difficult. They may find they need help coping with the emotional as well as the practical aspects of their disease. In fact, attention to the emotional and psychological burden of having cancer is often part of a patient's treatment plan. The support of the health care team (doctors, nurses, social workers, and others), support groups, and patient-to-patient networks can help people feel less alone and upset, and improve the quality of their lives. Cancer support groups provide a safe environment where cancer patients can talk about living with cancer with others who may be having similar experiences. Patients may want to speak to a member of their health care team about finding a support group. This booklet is designed to help you get information you need from your doctor, so that you can make informed decisions about your health care. In addition, asking your doctor the following questions will help you further understand your condition. To help you remember what the doctor says, you may take notes or ask whether you may use a tape recorder. Some people also want to have a family member or friend with them when they talk to the doctor -- to take part in the discussion, to take notes, or just to listen. What tests can diagnose lung cancer? Are they painful? What lung cancer treatments are recommended for me? Will I need to be in the hospital to receive my lung cancer treatment? For how long? How might my normal activities change during my lung cancer treatment? What side effects should I report? Whom should I call? After treatment, how often do I need to be checked? What type of followup care should I have? Who will be involved with my treatment and rehabilitation? What is the role of each member of the health care team in my care? What has been your experience in caring for patients with lung cancer? Are there support groups in the area with people I can talk to? Are there organizations where I can get more information about cancer, specifically lung cancer?